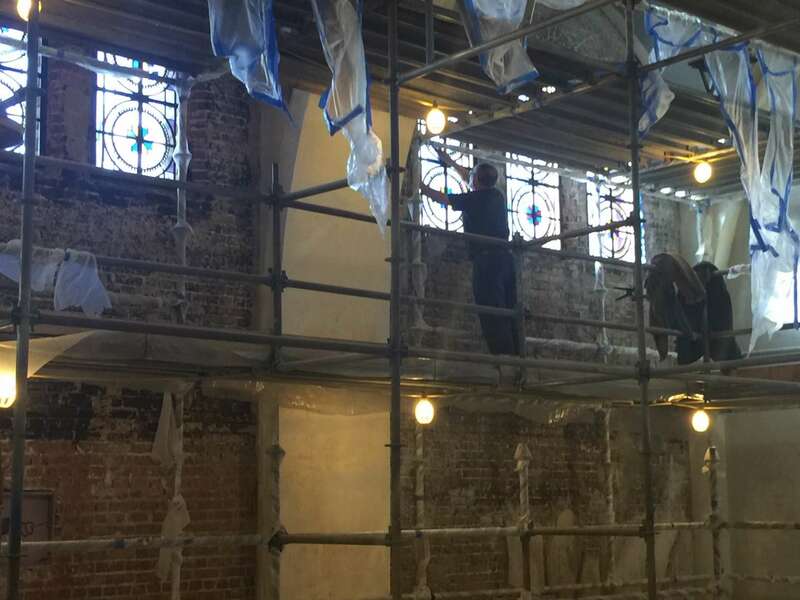 Work on the stained glass windows continue. 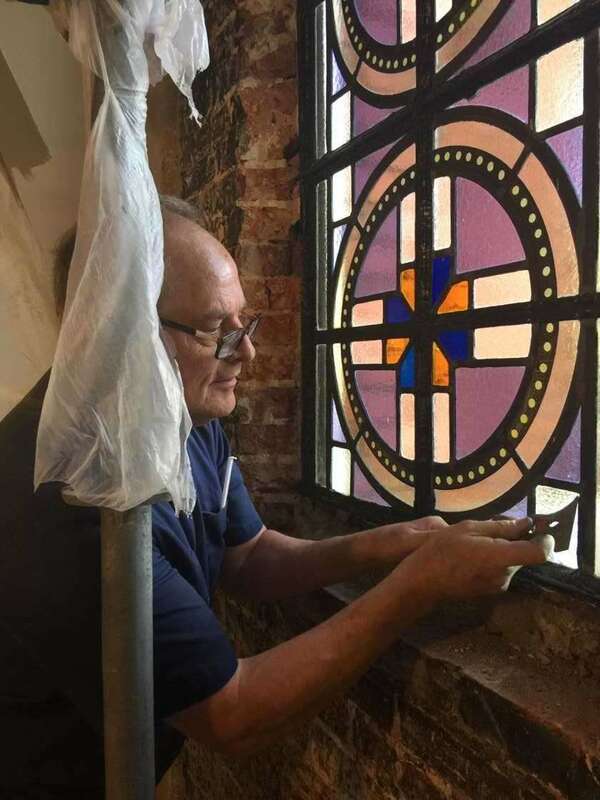 Stephen Frei of Emil Frei & Associates removing a piece of broken glass, which will be sent to their studio in St. Louis, Missouri for fabrication of a replacement. 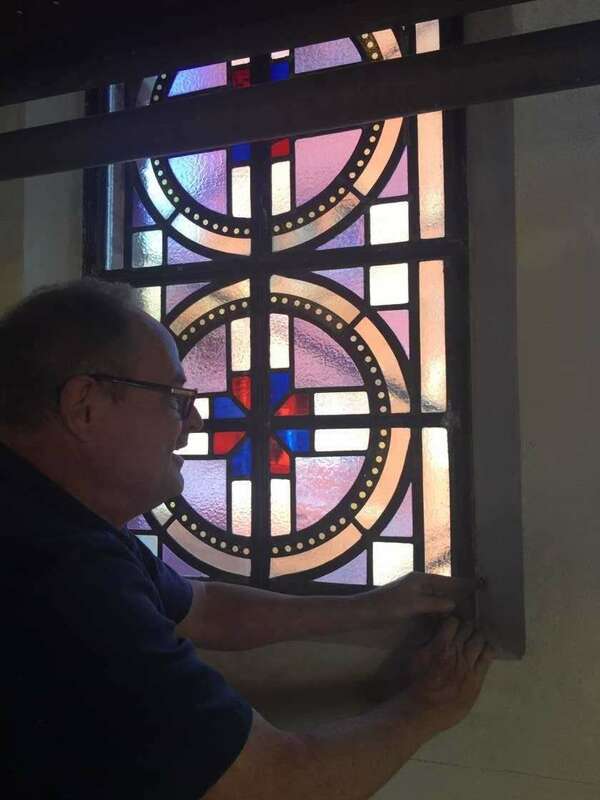 Stephen showing me the venting hole, which will assist in regulating humidity and removing condensation between the stained glass and the protective glass outside. 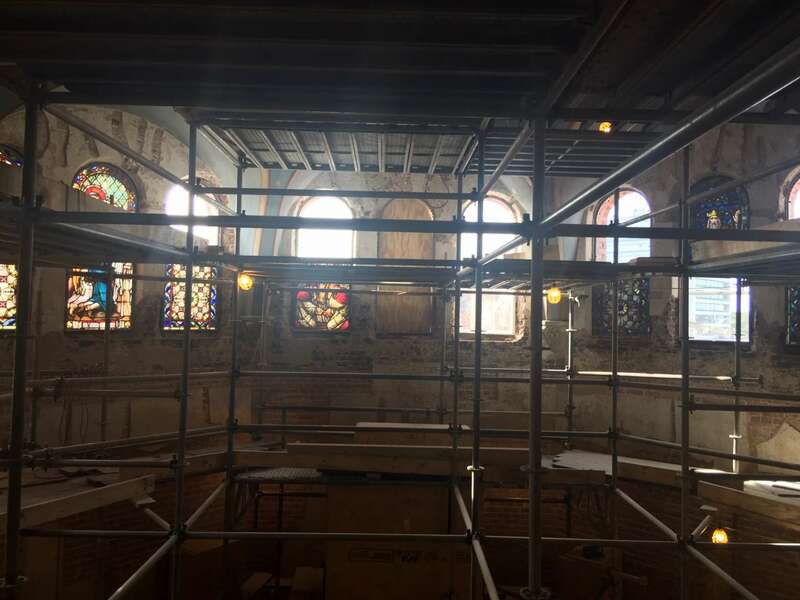 Sections of the stained glass windows above the High Altar were taken out for cleaning and repair in their temporary studio in Lake Charles. 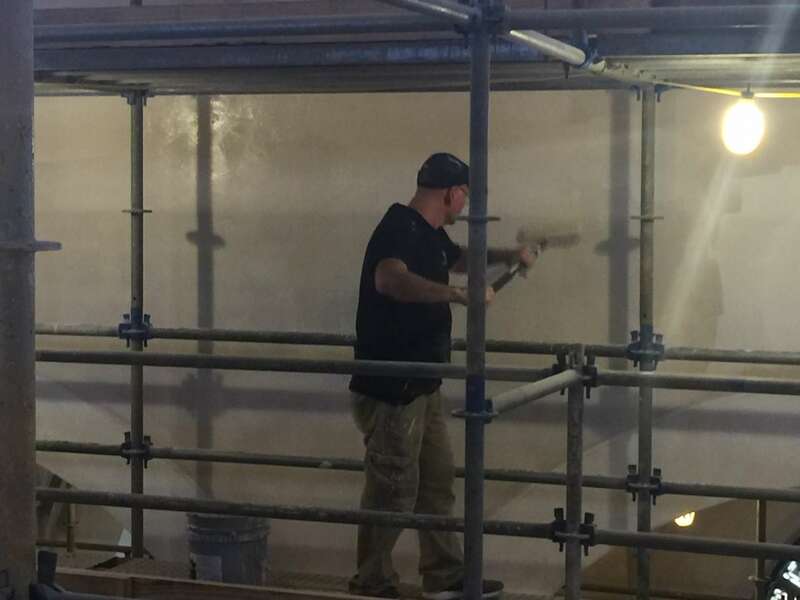 Meanwhile, artisans from Conrad Schmitt Studios are on site to begin the painting and interior decorative design. 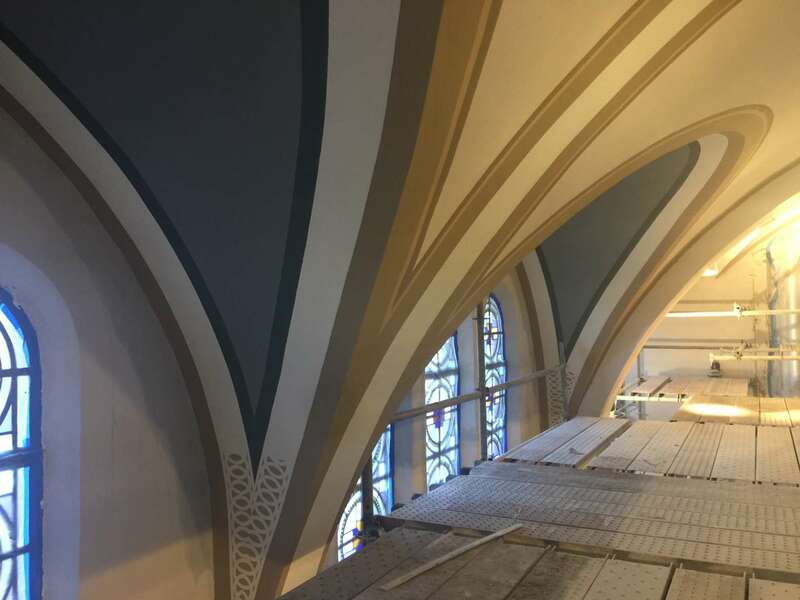 Painter applying primer on the nave walls. 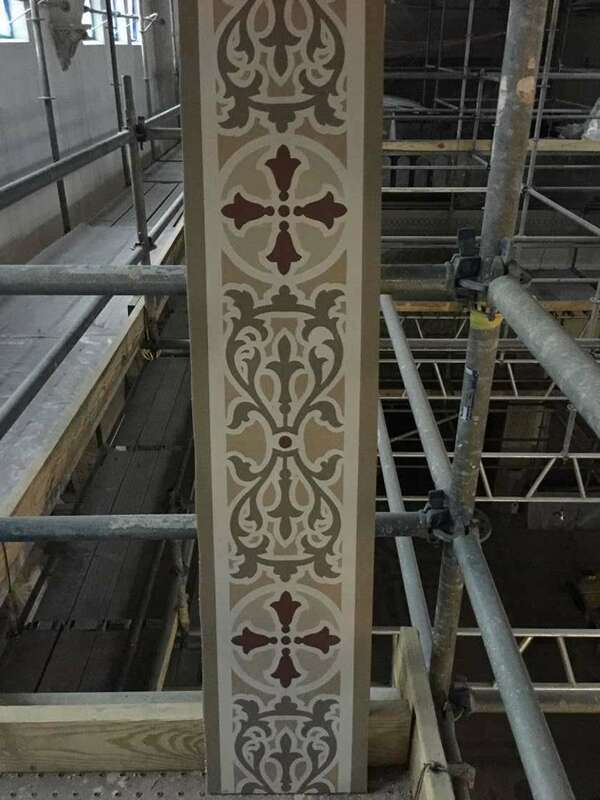 Here's a small sample of what the nave walls will look like. 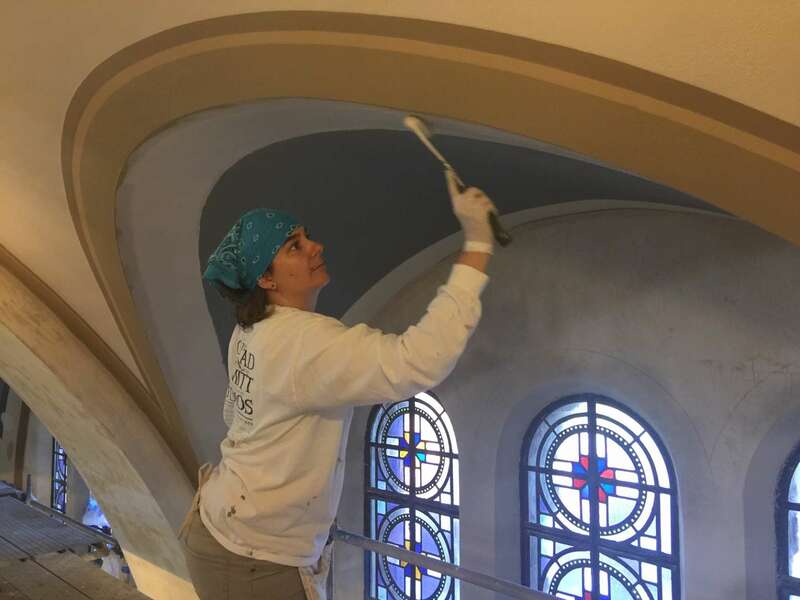 Kim from Conrad Schmitt Studios painting the ceiling cove above the clerestory windows. Here's a more advanced (but not completed) stage of the painting. 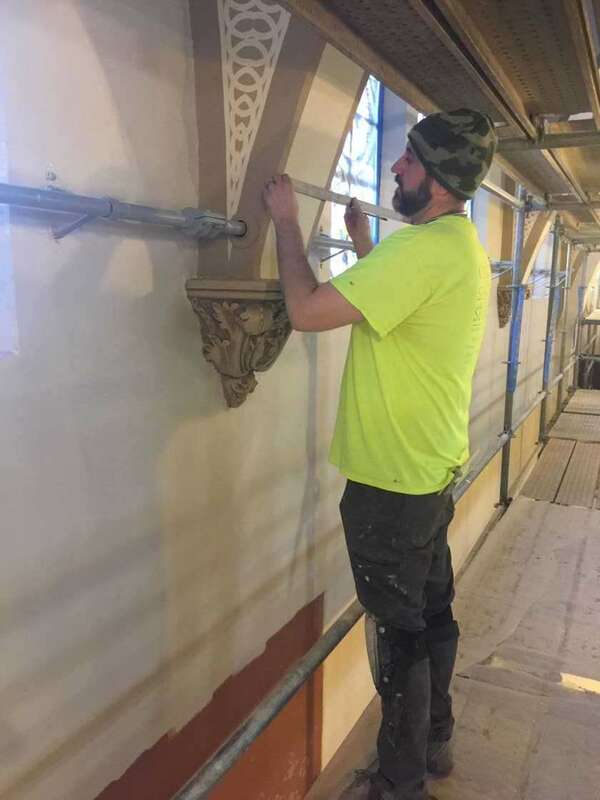 Marking the nave arches above the corbels to get it ready for stenciling. 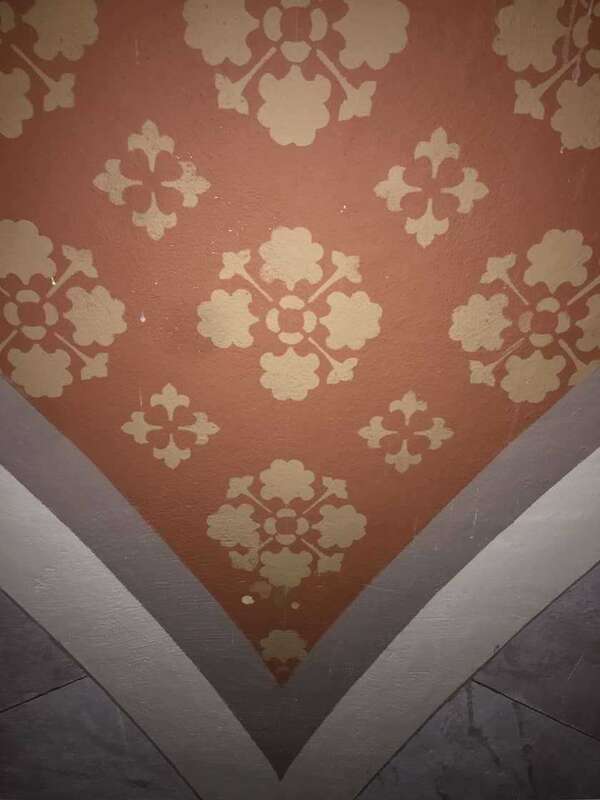 Here's the stencil design for the arches above the corbels. 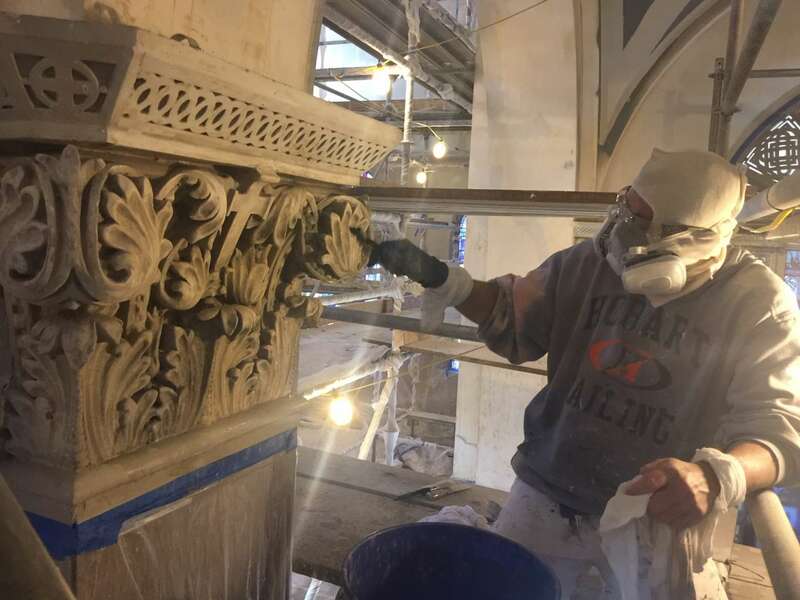 Cleaning the column capital with brush and water. 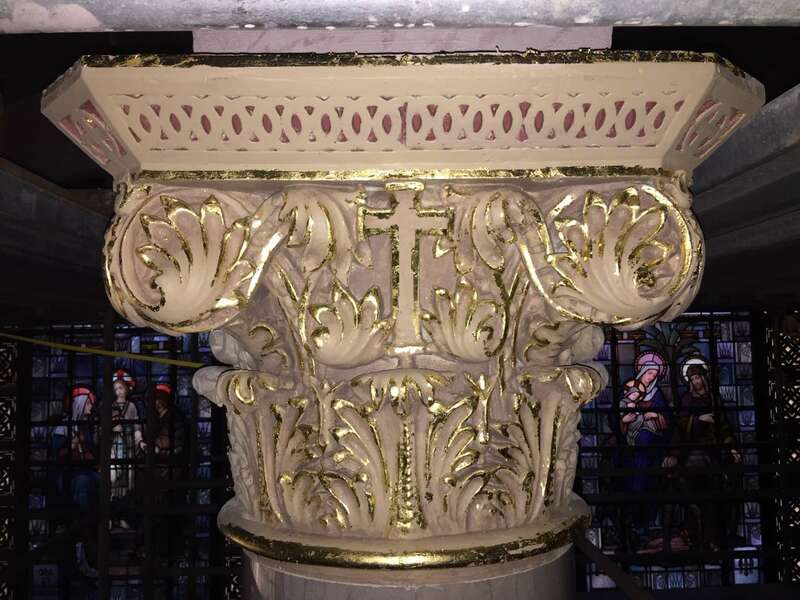 The Corinthian capitals will be gilded in gold leaf as shown below. 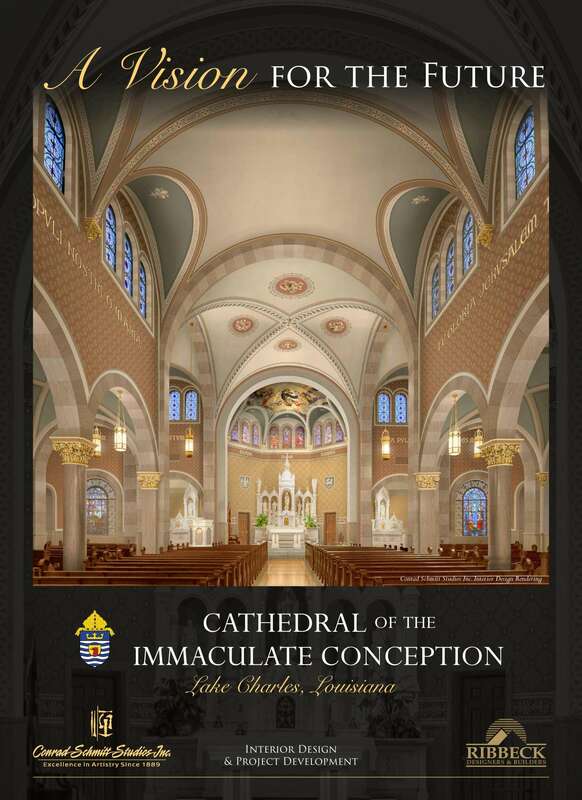 For those wondering what the church will look like inside, here's a rendering from Conrad Schmitt Studios. Stay tuned for our weekly photo updates!